We've made our Deluxe Riverside Lodge (1 only) very spacious, comfortable, private, relaxed and have taken advantage of the spectacular sweeping views of the river, just 10 metres away. Three sets of double glass sliding doors open onto the large oiled timber deck so that no matter if you're in one of the 2 bedrooms or in the kitchen/lounge, you always know you're right on the river. The kitchen comes well equipped so you can make yourself entirely at home. It has a full-size fridge, microwave, electric frypan, toaster and kettle as well as dining table and chairs. Outdoor table and chairs means that you can soak up that perfect river panorama, whether you're relaxing or dining on the large covered deck. Check our rates or for more pictures, see our photo gallery. We have two Riverview Lodges available - a two-storey lodge (Lodge 7) and a one-storey one (Lodge 8). The differences between our Garden Lodges and our Riverview Lodges are that the latter offer fabulous views (Lodge 7 of the treetops and Lodge 8 of the river), have 2 bathrooms, 2 TVs and some extra decking. This makes these cabins an excellent choice for couples, groups of friends and families. A main bedroom, a second bedroom with a triple bunk (single on top, double below) and a sofa bed in the lounge.The kitchen has a full size fridge, electric frypan, toaster, kettle and microwave as well as dining table and chairs. Both bathrooms have a shower, toilet and vanity basin. Large covered decks with outdoor table and chairs allow you to enjoy the river view at all times, whether you're relaxing or dining. Check our rates or for more pictures, see our photo gallery. There are 5 Garden Lodges. With views of the gardens and the pool, and glimpses of the river, these lodges are comfortable and suited to families and couples..
Four people will be comfortable with the queen bed in the main bedroom and double bunks in the second walk-through bedroom.A sofa bed in the living area enables an extra person to be accommodated if needed. A single bathroom comes off the bunk bedroom. 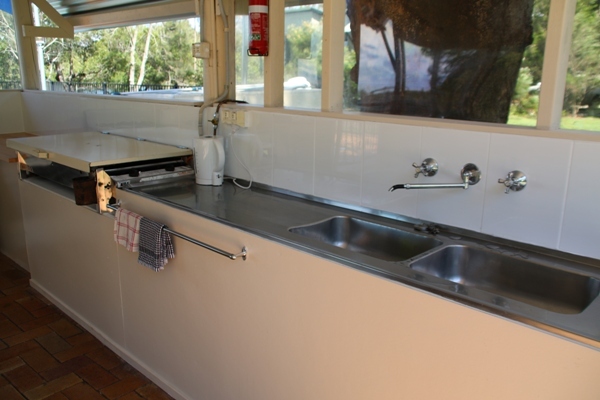 The kitchen has a full size fridge, frypan, toaster, kettle and crisping microwave as well as dining table and chairs. A covered deck with outdoor furniture means you can enjoy the fresh air and listen to the birds, looking onto the native gardens, the river and pool, whether you're dining or relaxing. Check our rates or for more pictures, see our photo gallery. There is 1 Deluxe Garden Lodge. With views of the gardens and the pool, and glimpses of the river, this newly renovated cabin is suitable for couples. Our newly renovated Deluxe Garden Lodge provides an extra level of comfort and roominess for a couple in a contemporary while rustic setting. The verandah has a garden view and a vista down to the river. You will sleep well on our high quality queen bed after luxuriating in your private bath or shower. The kitchen is equipped with a fridge, electric frypan, toaster, kettle, single burner induction stove top and microwave as well as a dining table and chairs. A comfortable lounge completes the living area. A TV is provided in both the living area and the bedroom. Outdoor furniture on the deck means you can eat outside or just relax and listen to the birds. This is a new house. With a garden view and large deck, the house is comfortable and suited particularly to families and groups of couples. Up to 8 people will be comfortable in the four bedrooms. There is a queen bed in one bedroom, two bedrooms with double beds, and one bedroom with two single beds. One double bedroom is downstairs. There is a toilet and separate bathroom upstairs. Downstairs is a separate toilet and combined bathroom/laundry. The kitchen is fully-equipped with a family-size fridge, stove, frypan, toaster, kettle and microwave as well as dining table and chairs. A large covered deck with outdoor furniture and a BBQ gives you a private area to enjoy the fresh air and listen to the birds, whether you're dining or relaxing. Check our rates or for more pictures, see our photo gallery. Barbecue: Whether you're using the large barbecue or just relaxing in the poolside BBQ area, you'll find everything you need - a large barbecue, 2 sinks, 3 large tables and benches as well as crockery, cutlery and glassware for you to use. Swimming pool: Our 11-metre pool, set in our beautifully landscaped native gardens, is suited to everyone. There is shade to protect you from the sun in the middle of the day and its positioned at the shallow end to make it suitable for small children in the summer. Soak up the sun and the sound of birds as you enjoy some well-deserved R&R, looking down the river or up to the sky, framed by huge gum trees and river oaks. Canoes and paddle boats: Our rates also include free use of our canoes and paddle boats. Have a look at our beautiful gardens, pool and barbecue area in our photo gallery.